Combine lime juice, 1/4 cup oil, garlic, pepper, red pepper flakes and salt; pour over chicken. Cover; refrigerate 2 hours. In a large skillet, saute chicken and onion slices in remaining oil for 10 to 12 minutes or until done, stirring frequently. 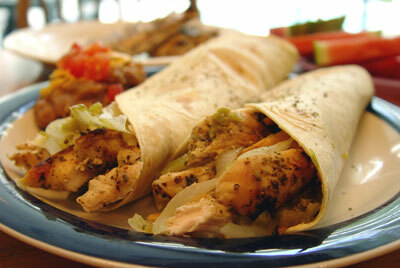 Serve on tortillas with guacamole, salsa, lettuce and sour cream, if desired.